As Mental Health Awareness Month comes to an end, you’ve probably heard about the importance of therapy many times by now. Now you’re finally convinced that therapy isn’t restricted to people living with a major mental illness and realize you don’t have got be in crisis to go to therapy. The problem is you don’t know where to start on finding a therapist. 1) Ask for a Referral from People You Know: Don’t be afraid to ask people you know if they can recommend a trusted therapist. Most people are eager to share a referral of services they love. Therapy is no different. Ask them what they like about the therapist; why they chose them; what they gained from therapy with them. 2) Ask for a Referral from a Physician: Medical professionals often have a network of referral sources, including therapists to whom they refer clients. If the reason you’re seeking therapy is related a medical issue, you can also sign off medical consent for your physician to collaborate your care with your therapist. Addressing both medical & mental health issues is key to getting the most out of your therapy process. 3) Use an Online Therapist Directory: If you rather find a therapist on your own then hop online. There are several online directories, including melaninandmentalhealth.com which specializes in listing culturally competent therapists, that you can search by your location to find a therapist near you. Most of these websites will include a link to the therapist contact info. This is a great way to review several of your options at once. 4) Call the Therapist: Now that you have a referral, maybe even a few referrals, reach out to the therapist. Call them and tell them you’re interested in going to therapy but first, you want to find out a bit more about their service. Some therapists, such as myself, offer free phone consultations. These consultations are the perfect opportunity to give the therapist a general overview of what’s bringing you to therapy (remember, this won’t be a therapy session) and asking them a bit more about their practice. This also allows you to get a feel for the therapist’s personality on the phone. Finding a therapist that you feel is a good fit for you is essential to the therapy process, so if the vibe feels off, don’t be afraid to keep looking. The process of finding a therapist can be overwhelming, especially, if you’re eager to start on the path towards healing. Stay encouraged and remember, there is strength in seeking support. Use the tips listed above and commit to the process. Remember, therapy works if you work the therapy! 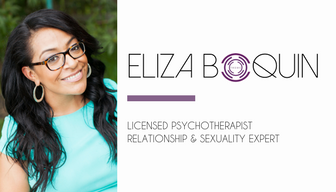 As a Licensed Psychotherapist, Relationship & Sexuality Expert, and Owner & Founder of The Relationship & Sexual Wellness Center, Eliza Boquin works with couples and individuals to overcome any traumas, pain, or destructive patterns that keep them from enjoying healthy, satisfying, and pleasure-filled lives. By working with clients in her office, online, and in workshops Eliza helps people gain the skills necessary to get closer to their life and relationship goals. She is also the co-founder of Melanin & Mental Health, an organization committed to spreading mental health awareness in Black & Latinx communities. She believes that pleasure is our birthright and shame is one of the greatest blocks to enjoying healthy, balanced lives. Eliza's journey of finding healing through self-compassion drives her to help others heal from shame. Topics of discussion she frequently comments on include: Unapologetic Self-Care, Therapy Stigma in Minority Communities, and Mutually Satisfying Healthy Relationships. Her advice has also appeared in Bustle, ThriveWorks, Good Therapy, Stylecaster, Fatherly, Business Insider, and various local radio stations in Houston, TX including Amazing 102.5.